Horror: Fuel Tanker Crushes Motorcyclist To Death In Ondo Few Weeks After His Wedding (Graphic Photos) - NAIRAFAME | Best Entertainment Platform. 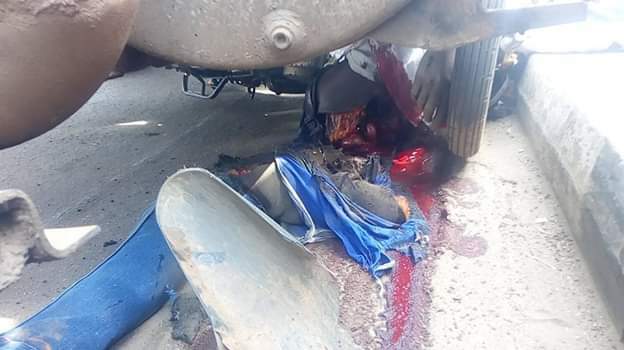 A commercial motorcyclist has been reportedly crushed to death by a fuel tanker in a community in Ondo state. 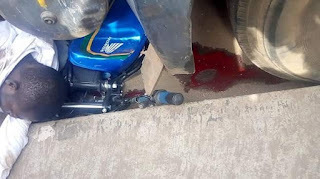 A commercial motorcyclist simply identified as Kayode, has died in Ondo. Kayode was crushed to death by a fuel tanker at Oma Junction, Alagbaka area of Akure, Ondo State capital on Friday. Local reports show that the incident happened when the fuel tanker which was heading towards Yeoma Plaza was stopped by the traffic warden on duty. The tanker driver lost control of the vehicle and rammed into the motorcyclist who was approaching the junction, killing him on the spot. The younger brother of the deceased escaped unhurt from the accident but lamented that Kayode got married a couple of weeks ago, while his wife is pregnant. Angry Okada riders, however, besieged the scene of the accident and descended on the driver of the vehicle. He was quickly rescued by some security operatives who took him away.